Born Thaddeus Yarosz on June 24, 1910 in Pittsburgh, PA. The son of Polish immigrants, Teddy and his family moved to Monaca, PA when he was 10-years old. Teddy, along with his older brother Eddie, were both interested in boxing despite their father's objections. After their father's death in 1926, the brothers took up amateur boxing and became standout lightweights in Western Pennsylvania. A member of the Pennsylavania team that competed in the 1929 national championships in Boston, Teddy lost in the finals. He turned pro in June of that year and was undefeated for his first 59 fights before losing to Eddie “Kid” Wolfe in 1933. 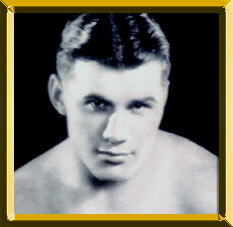 Wins over Tommy Freeman, Paul Pirrone, and a pair of 10-round decisions over Vince Dundee followed before he won the Pennsylvania world middleweight title in 1934. A successful defense over Ben Jeby and a 4th round kayo over Pete Latzo set up an NBA / New York middleweight title bout against Dundee. Behind persistent left jabs and a dual handed body assault he won a 15-round decision and the title. A year later, he lost the title to Babe Risko over 15 rounds. Although his reign as champion was over, some of Yarosz's best bouts were still to come. Before retiring in 1942, he logged impressive wins over quality opponents including Risko, Ken Overlin, Solly Kreiger, Lou Brouillard, Ralph DeJohn, Archie Moore, and Lloyd Marshal. He retired from the squared circle with a pro record of 106-18-3 (16 KOs) and a reputation as an honest fighter whose skills were good enough to turn back some of the greatest ring men of his time. In retirement he owned and operated a bar called Teddy's Inn and later worked in the steel industry. Yarosz died at age 63 on March 29, 1974 after a battle with cancer.